It’s no secret that the economy is behaving in an unprecedented and unpredictable manner. For the small business this can add an increased amount of uncertainty to an already volatile environment. But it can also create opportunity. As the economy continues to go through an adjustment new market opportunities are being created by agile small businesses able to move faster than market forces and find themselves on reaching out into new frontiers. 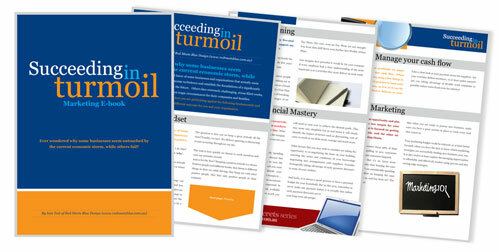 One of our Intervals customers, a design and branding agency named red meets blue, has written a marketing E-book entitled Succeeding in Turmoil and is offering it for free on their web site. In response to the risk and the opportunity we see every day we have put together a very relevant E-book called “Succeeding in Turmoil”. It is very focused, well written and clearly identifies some strategies that could make an enormous difference to your immediate and long term prospects. We highly recommend downloading and reading the E-book. And while you are on the redmeetsblue web site, check out their great portfolio of work. Click here to download the complimentary PDF.